Everything, but the kitchen sink. Yeah, that's about it. Bacon, pork sausage, smoked sausage, chicken, and shrimp are all in there. 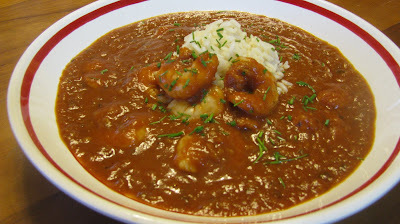 This makes a big gumbo pot full, so invite the family and friends over. 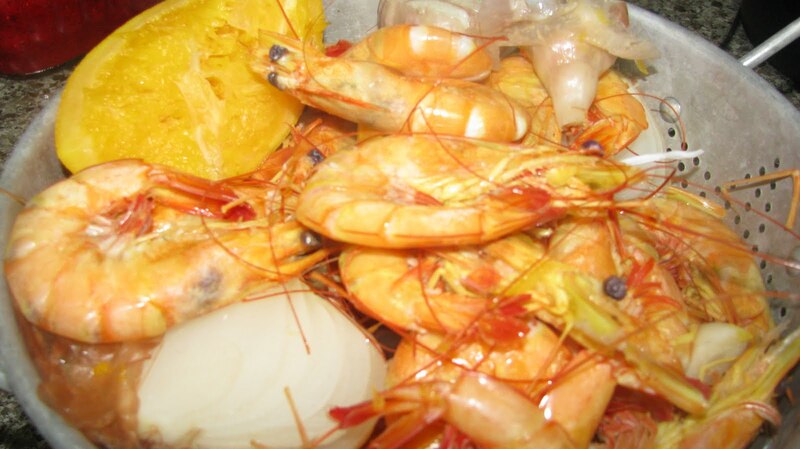 · You can make shrimp or chicken stock. It is easy! Follow my link to find out how I make mine. · If you don’t have a cast iron pot you can make a roux in a heavy bottomed pot instead. The trick is to stir constantly. You can NOT multi-task during this step. This is where the base of flavor for your jambalaya comes. Be diligent, it takes about 15 minutes to make a roux the color you need. · I use Bryan Cajun Smoke Sausage. · ½ C. of hot sauce might have you scared. Don’t be! 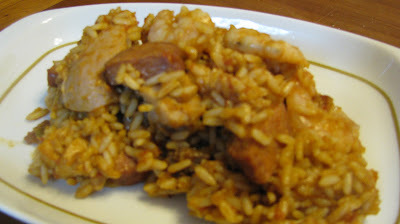 The sausage, chicken, shrimp, and rice all absorb the hot sauce and give this jambalaya a great flavor. It is spicy, but not tongue numbing. 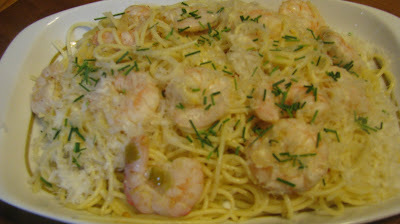 Shrimp with garlic and lemon, Yum! This is another Barefoot Contessa recipe that I have slightly tweaked. It is so flavorful and makes a nice presentation. I use Angel Hair pasta for this as well. I sprinkle some fresh chives over the top when I serve this dish. It is not necessary. 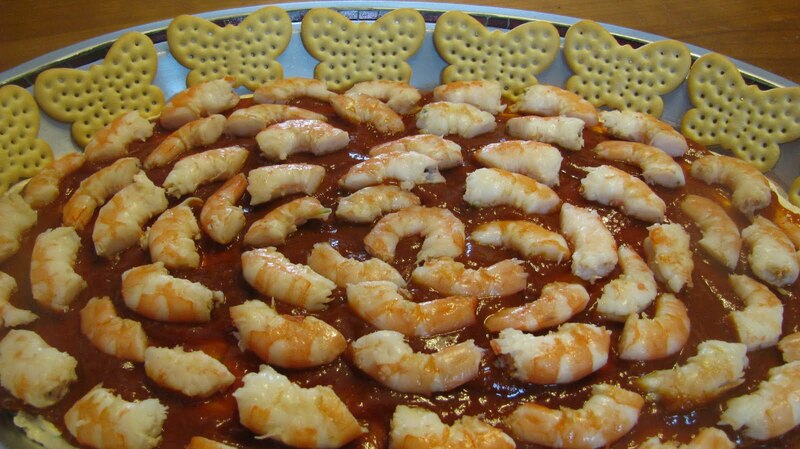 This is the appetizer that we have at just about every family function. It is a recipe from my cookbook that Darlene made for me. If I had a dollar for every time I've made this recipe, I'd be rich. Let cream cheese soften, before starting to make this appetizer. 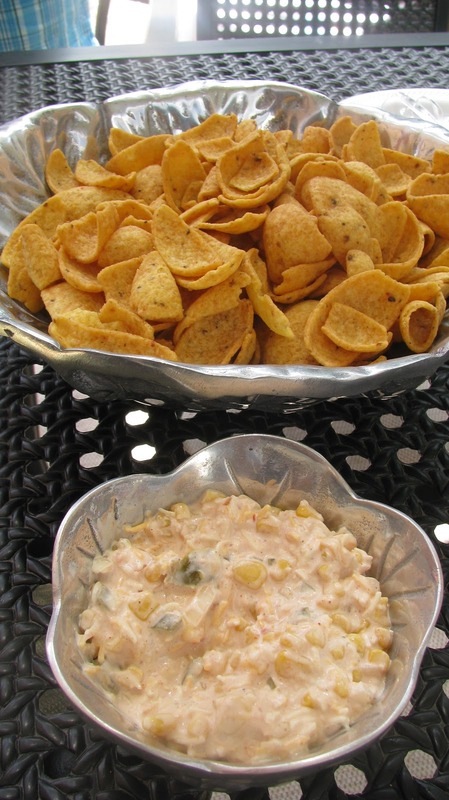 I serve this dip with Butter Thins from Pepperidge Farms. This is my Dad's tried and true recipe for boiling shrimp. They are always yummy when prepared this way. My Dad swears that the reason his shrimp would always peel easily is because he put the salt in AFTER the boiling. It works. This recipe can be altered for more or less pounds of shrimp, but be careful with the crab boil. I like my seafood spicy and use a tablespoon for each pound. This is NOT what the label recommends. If you want potatoes and corn, just fish the shrimp out of the water and use the same water for a quick one pot meal. I have about three different recipes from three different people and they are all similar, but each one changes a few things. This is a combination of those recipes. This a great dish for a picnic or pool party. It tastes best cold, but it can be left out because it has no mayo. To crush the ramen noodles, place in a Ziploc bag and roll a rolling pin over the noodles until they are in bite size pieces. If you don’t have a rolling pin, use a mallet or even a coffee mug to crush the noodles. Don’t be tempted to add SALT. The flavor packets from the ramen noodles are full of salt and extra salt is NOT necessary. Sesame oil can be found on the international aisle of the grocery store. It spoils quickly and you won’t be using much, so keep in the refrigerator to extend the life of the oil. This was my favorite dish growing up. My Mom is a great cook and this is her recipe. You can make shrimp stock to use instead of the water. It is easy! After you peel your shrimp, place everything that is left in a big pot with 12 C. of water, 2 onions cut in half, 4 stalks of celery, 1 head of garlic cut in half, 1 T. Tony Chachere’s Creole Seasoning. Boil for 1 hour then strain stock. This Creole is very smooth. If you like a chunkier sauce, you can use crushed tomatoes instead of the sauce. Rotel tomatoes are good for this also, but cut out the cayenne and hot sauce or it may get too spicy. Easy, yummy! The broccoli becomes almost nutty tasting after roasting it. The other ingredients don't hurt the flavor either. Steaming the broccoli is not necessary, but I have baked it and it has remained very crunchy. I like broccoli more on the soft side. 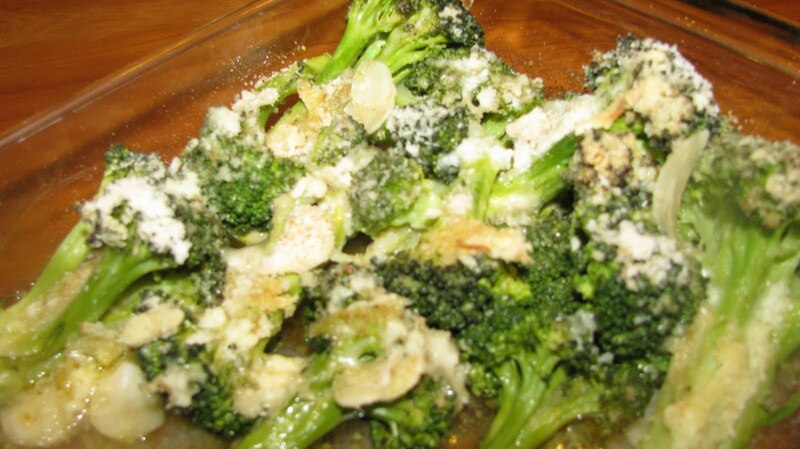 If you like crunchy broccoli, don’t steam it. This is a recipe from the Neelys. I have tweaked it a bit. 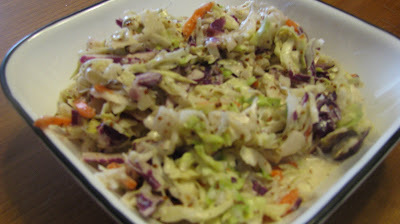 This is a great side dish when grilling. This is so yummy on a pork sandwich. 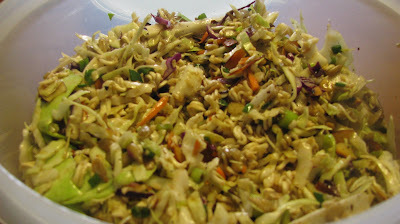 We have added 1 C. of sunflower seeds to this recipe, when we want the saltiness and crunchiness of the nuts. I do not know where I got this recipe. It is typed on a plain white sheet of paper. What I do know is I like it and so do others. It's a quick fix dip. 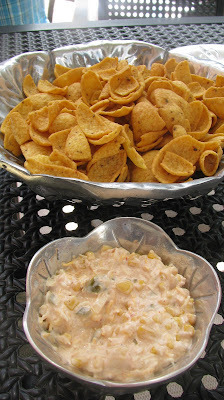 I serve this dip with Fritos Scoops. You can use any corn for this recipe. I like the white and yellow mix. DelMonte and Green Giant both have a white and yellow mix. Mexican cheese is not necessary. Cheddar is fine, but Kraft has a bag of shredded Mexican cheese.